Insert Quarter (25¢) here. Warning: Rocking or tipping this machine may result in serious injury or death. I’ve been back to Little Ferry, recently. My second visit since my family moved away in 1972. The Wilson School is long gone, torn down in 1981 or so. That stolid two-story rectangle of dark red brick and high narrow windows (surrounded by a fenced-in acre of crumbly blacktop) has been replaced by a little condominium village well-provided with plenty of shade trees. The lake across the street is still there, though. Little Ferry has three lakes—Willow Lake, Indian Lake, and a fairly large body of water at the end of Mehrhof Road which seems to have no name at all. None of them are natural formations. They all began as clay excavation pits associated with the brickyards that flourished in Little Ferry in the late 19th and early 20th centuries. Willow Lake, the lake across from Wilson School, was always the least “lake looking” of the three. Its shores were barren dirt, and it always looked like a round pit with brown water in it. It was surrounded by a chain-link fence and was deemed off-limits to us. In fact, it was so off limits that I can’t recall anyone ever going near it. There was always talk among us kids that Willow Lake was going to be filled in and replaced with something grand—an amusement park, a horse farm, ballfields. It’s still there, though, and now looks more like a real lake than ever. Trees and sturdy undergrowth have crowded right to the water line. Busy flocks of ducks were paddling this way and that across its surface. Egrets were stalking the shallows, snapping food (whatever it is that egrets eat) out of water that now seems a perfectly robust slatey-green. The chain-link fence is gone. Nature repairs itself, if you give it the least opportunity. First prize in that poster contest was an AM transistor radio. A little heavy rectangle of beige plastic with two ridged wheels set into its side (one for on-off/volume, one for tuning). You rotated the tuning wheel and a little orange indicator line prowled across a tiny window hashed in the denominations of the AM radio band. I dialed that little line over to Music Radio 77 WABC (home of Dan Ingram, Cousin Brucie, Harry Harrison, and the Weekly Music Survey), and left it there until the day, a few weeks later, when the radio got jostled off the second-floor porch railing of the apartment house my family lived in. Then as now, the returns on investment for creative endeavor were pretty meager. This entry was posted in Incriminating Evidence by Harry Ramble. Bookmark the permalink. I like the idea of a tree museum. I sort of have one — I’ve planted hundreds of trees. I enjoyed reading your article. 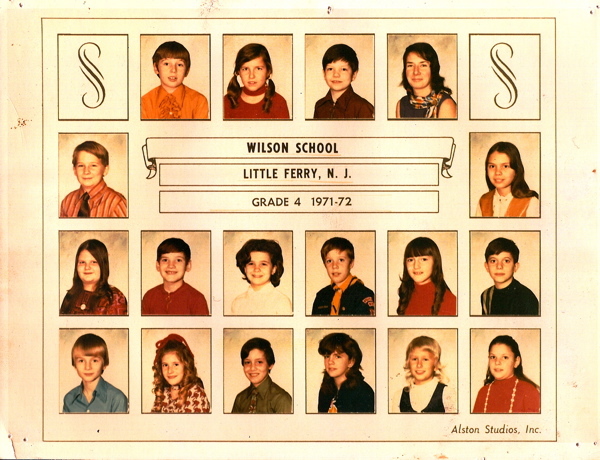 My family and I came from Germany and I went to Wilson School Kindergarten 1969-70 and1st grade 1970-71. We lived on Kaufman Ave and I will always remember Halloween my little sister and I being princesses. I am looking at my class picture and I wonder what life all these kids have now. I visited Little Ferry in 1989 and was so upset to see the schoolhouse gone. Those few years a spent in Little Ferry were the best of my childhood. 1966 graduate of Wilson School here. Loved the description of the school, town and especially Willow “Lake”. Come to think of it, in all my years of walking back and forth to school from 1957 to 1966, I never saw one living thing in or on Willow “Lake”. Not a duck, or anything. But I’ll tell you one thing, I loved that school. I can name every teacher i had too, and all my friends. Hope you get this. P.S. I lived on Beech Street, a dead end (literally). I don’t remember every teacher I ever had, though I do remember the teacher in the photo I added (above) to this story. Miss Kaner. I learned recently we were her first class. She worked 40 years (give or take) in the same school system and is now (I believe) retired. I can also remember most of the names of the students in the photo. I can remember playing dodge ball and “box ball” in the schoolyard. Box ball was like kickball, except you bounced a Spaldeen pinky on home plate, hit it with your fist when it reached the top of its arc, and rounded the bases. We used the same pinky to play “stoop ball” on the steps in front of our house. I can remember wandering the streets of Little Ferry, unsupervised as long as the sun was up, getting into all the trouble a 7, 8, and 9-year-old can devise. The clay excavation pit must have tapped into an underground water source related to the Hackensack River. It was an eyesore in 1970, but is now just a humble little town lake with marsh grass, ducks, and egrets. My family lived in an apartment on Marshall Avenue until July of 1972. Out of the blue I started thinking about Miss Kaner this morning wondering if she is still alive. I decided to google her and your story popped up! I love it, I have great memories of Little Ferry. I went to kindergarten in 1976, and lived there till I was 13. I lived right around the corner on Poplar Ave and would play on the school ground almost everyday. I played basketball, tennis against the side of the brick wall, and stick ball. We would even climb the school fence to get the chestnuts from the neighbors yard. We would also ride our bikes in the school yard, and would stay out till our mothers would yell for us out the window to come home for dinner. I have been back several times, as I know people who still live there, but it’s so different now. Thanks for the story and for posting the pics, it’s nice to know that others have fond memories of this little town.